Like a rhinestone cowboy...and The Ramones? Where can you find Country music superstar suits, guitars owned by The Ramones and a whole bunch of banjos? The auction features a large collection from the Estate of Country Music Hall of Fame and long-time Grand Ole Opry member, Little Jimmy Dickens. Dickens was known for his cheeky novelty songs, his small stature - measuring 4ft 11 and his rhinestone-studded outfits which he is given credit for introducing to country music. Highlights include many of Dickens' custom stage-worn Nudie Suits, hats, and boots, made by Nudie Cohn, who was famous for outfitting Elvis in gold lamé and John Lennon in Western wear. 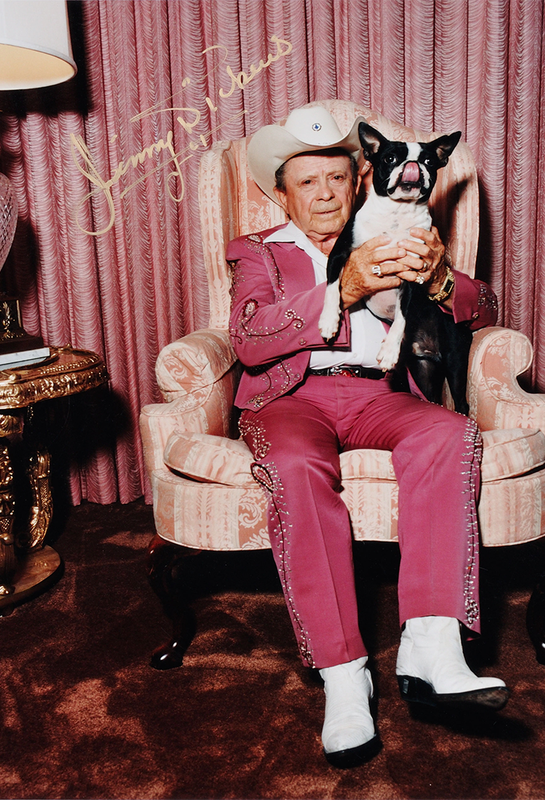 From Nashville to Beverly Hills, anyone who was anyone owned a Nudie suit, and Little Jimmy Dickens owned many. 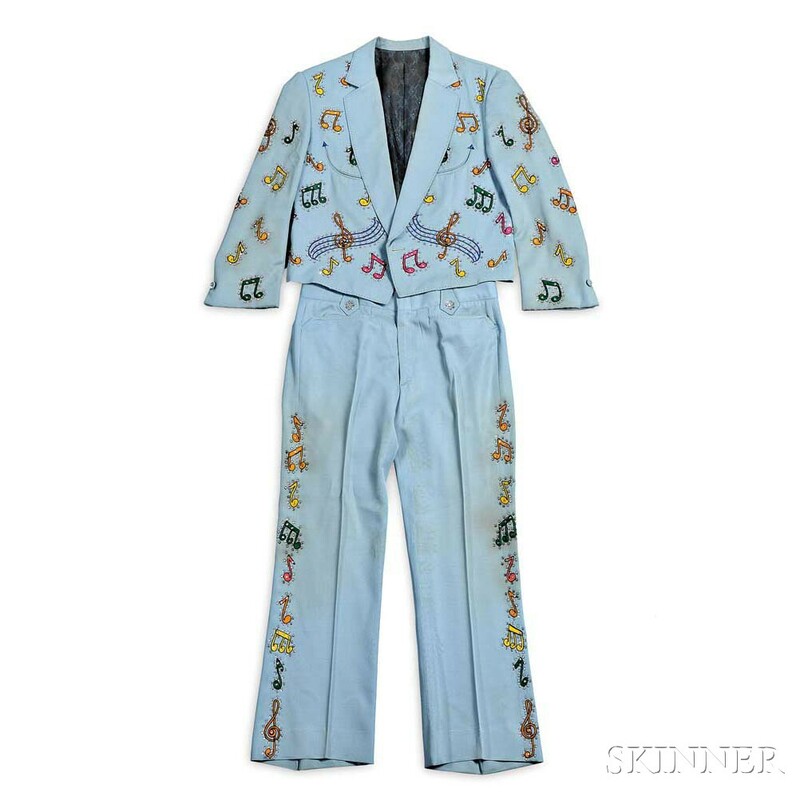 A standout Nudie Suit is a robin's egg blue jacket and pants with orange underlay and piping, and matching orange felt cowboy hat and leather boots, estimated between $3 000-5 000. Nudie Cohn's designs also feature in the sale in the form of five-time Grammy winning multi-instrumentalist, singer-songwriter, and photographer, Marty Stuart's stage wear. A unique convertible top boot, c. 1973 from one of Cohn's ''Nudie Mobiles,'' bearing the signatures of dozens of his celebrity clientele, including John Lennon, Johnny Cash, Elvis Presley and others is estimated at $20 000-30 000. A rare pair of Mosrite electric guitars owned by The Ramones -estimated at $15 000-25 000 and $40 000-60 000- will be going under the gavel. Following the Ramones retrospective at the Queens Museum which finished this summer, these pieces are sure to have fans reaching for the paddle. Skinner's will take place on November 5. Previews will be held in Boston on November 3, 4 and 5. Check out the full catalog here.